The future of Hebron is in your hands - the time is NOW! Rarely does a chance like this come along. Rarely - if ever - do you find a unique moment in time to create a lasting impact for the holy city of Hebron… the resting place of Abraham and Sarah, Isaac and Rebecca, and Jacob and Leah. Never before have the political winds aligned to grow the Jewish presence in Hebron. All that is missing is YOUR support. Please donate to the Hebron Fund and improve the daily lives of the city’s Jewish residents. For the first time in 50 years, TWO new neighborhoods IN HEBRON have been approved. Israeli Knesset officials are funding new housing in the Jewish Community of Hebron. The United States government is defending Jewish Hebron in the UN and on the world stage. The residents of Hebron are ready. But they need your help to flourish. It's urgent that we move Hebron forward while this window of opportunity is OPEN. New families are going to move into the area. They will immediately become pillars of a community that allows visitors from all over the world to access these holy sites. Now that these families have housing, we want to give them the safe, peaceful, normal lives they deserve. That’s where you come in. Your donation will help build playgrounds, a kindergarten, and a synagogue for these children. Your donation to the Hebron Fund will ensure that that Jewish children who live in Hebron grow up with the room to explore, dream, and imagine life’s endless possibilities. You can give the children of Hebron a gift that they will cherish forever. When these young boys and girls think back about their childhood, they will remember the playground that YOU helped build. They will think of their classrooms and synagogue that YOU helped furnish. They will think of the hundreds of thousands of visitors from around the world who came to visit and pray in Hebron (a record 40,000 visited for Shabbat Chayei Sarah last month)… just to breathe the same air as Abraham our forefather. Because of you, they will have swings and slides, desks and whiteboards, and a sanctuary for their precious prayers to reach the gates of heaven. Your gift is your declaration of our historical right to Hebron. Your gift demonstrates your willingness to defend Israel, no matter the obstacle. This recent wave of terror in Israel is threatening the stability of life for the Jewish residents of Hebron. There is no better time to give then now. Your donation will combat the terror by providing hope for a strong and happy future in the growing community of Hebron. 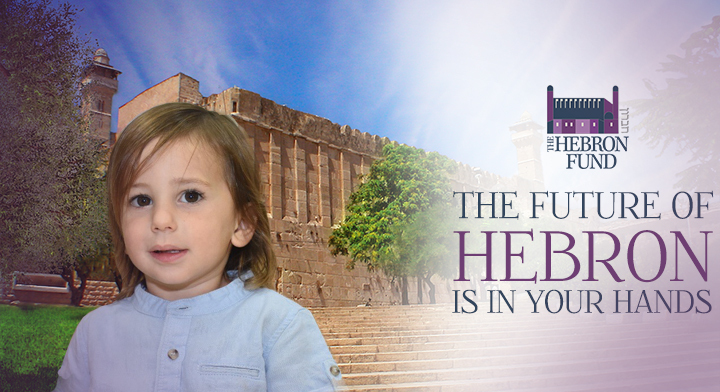 Your gift is an investment in Hebron’s future and the very best of the Jewish People. But this incredible matching opportunity only kicks in if you donate by 11:00pm EST on December 19th. None of this can happen without you. Your gift makes a difference for each one of our city’s children. Please donate today and give the children of Hebron the future they so richly deserve. Please give, and give generously. We don’t have a moment to lose. The future of Hebron and the Jewish People is in your hands - the time is NOW. Hebron Fund Inc is a U.S. tax exempt 501(c)(3) organization (tax ID # 11-2623719).